Every day is Earth Day at Margaritaville Beach Resort Playa Flamingo! We are blessed to live and work in paradise, where respect for and preservation of the land go hand in hand with our hospitality. Ecotourism in Costa Rica has long been part of our national culture and pride, and it is why Margaritaville Beach Resort Playa Flamingo maintains an unwavering commitment to environmental sustainability and support for our local community. At the Margaritaville Beach Resort Playa Flamingo , we have implemented environmental best practices in Water Use & Quality, Energy Use, Waste Management, Purchasing Policies, Air Quality, and Protection of Flora & Fauna. In 2011, we obtained our Certificate for Sustainable Tourism with a level of four "leaves," one of the best of all Guanacaste hotels. This means we have met stringent conditions to ensure that we maximize our energy savings, strive toward carbon neutrality, preserve our local flora and fauna, educate guests and staff as to best environmental practices, promote Costa Rican cultural values, and foster social development and equality. We continuously strive to support our community, promote sustainable tourism and protect the natural beauty of Costa Rica. Our mission is to offer eco-friendly hospitality to our guests in a clean, comfortable environment that enhances its natural surroundings. 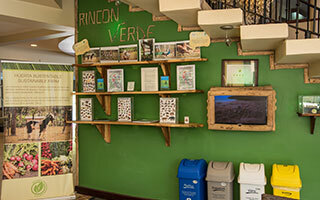 This ensures that every visit to Costa Rica is an immersion into a natural and healthy environment. Our vision is to preserve and protect the local environment so guests can return time and again to witness the same natural beauty of Costa Rica they experienced on their first visit. And we want future generations to enjoy the same pristine environment that their parents and grandparents discovered. We do so by investment in the technology, equipment and personnel that will continue to improve upon our strong environmental focus. Click here to learn how you can help us in our efforts to preserve Costa Rica! 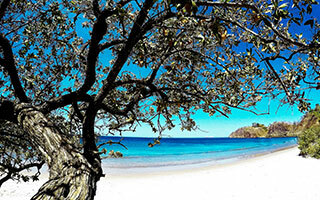 Playa Flamingo has received the highest Blue Flag designation for a beach in Costa Rica, that of three stars. The community recognizes that our efforts at the Margaritaville Beach Resort Playa Flamingo are a key factor in ensuring that Playa Flamingo has sustained its Blue Flag Certification and this year received a three star rating. The government established the Blue Flag (Bandera Azul) Certification program to engage all coastal communities in taking care of their beaches. Costa Rica′s Blue Flag program identifies and celebrates the cleanest and safest beaches based upon ecological quality and visitor protection, and certifies only the best beaches in the nation. Costa Rica's Blue Flag program has strict rating standards involving water and beach cleanliness. The National Water Laboratory conducts regular bacteriological sampling of water at our beaches, since water quality is one of the most important factors in Blue Flag status. Discover the natural beauty of Costa Rica at the Margaritaville Beach Resort Playa Flamingo and embrace the country's passion for preserving its pristine nature. Walk on our beautiful Blue Flag Certified beach, explore tidal pools teeming with sea life and catch amazing sunsets. Go birding in the mangroves in early morning to see several of Costa Rica's 850 bird species. Discover our magnificent blue ocean depths while SCUBA diving. Hike up hills of the peninsula, see magnificent views and listen to the sound of howler monkeys, squawking macaws and the songs of indigenous birds. Go swimming and boogie boarding in the beautiful Pacific Ocean. Enjoy an organic natural clay treatment in our OnZen Spa. This treatment uses 100% organic clay found in Costa Rica's rainforests and thermal springs. Enjoy watching the newborn leatherback turtle hatchlings find their way from their protected nests in the sand to the Pacific Ocean. How we run the daily operations of Margaritaville Beach Resort Playa Flamingo is where we can make the biggest impact on environmental preservation. We are proud of the efforts we have implemented across our resort to reduce our carbon footprint and preserve the natural resources we rely on. Examples of this include reducing bottled water at the resort by installing water filtration drinking water units for guest and staff use, and replacing incandescent light bulbs with efficient compact fluorescent and LED lighting. We installed a private well for resort use, thus lessening the demand on the local community's water supply. Likewise, we have installed low-flow faucets and shower heads that conserve water yet provide adequate water pressure for our guests. We have designed our resort to maximize natural air flow, thus reducing the need for air conditioning in public spaces like our lobby and the Sunset Lounge. We have also maximized the use of natural lighting across the resort. Waste Management - Solid waste is a major contributor to pollution, which is why we've implemented a composting program for all organic kitchen waste, and schedule and fund regular beach and mangrove cleanup initiatives. We also separate all our trash and deliver it to responsible recycling centers. To provide a healthy and disturbance-free environment for guests, we have designated all guest rooms and indoor spaces as smoke-free. Assisting our local communities is an important part of being a responsible corporate citizen. We collaborate closely with the CEPIA Association, a non-profit organization that promotes health, education, sports and culture for children and teenagers from low-income families in Guanacaste coastal communities. We also support other community organizations to fund and staff their initiatives. We adhere to a strict policy of only purchasing products that are environmentally friendly and support the local economy whenever possible. 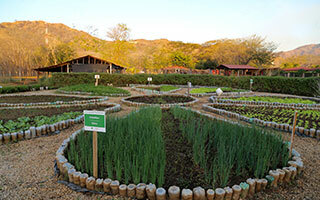 We have also planted our own organic garden which provides fresh ingredients for our chefs. Economic success, which provides jobs and drives economic prosperity.